Oh, I’ve started something now. Last week’s Knutsford trip out was such a treat that the idea of visiting a different Roastie venue each Sunday has firmly taken root. 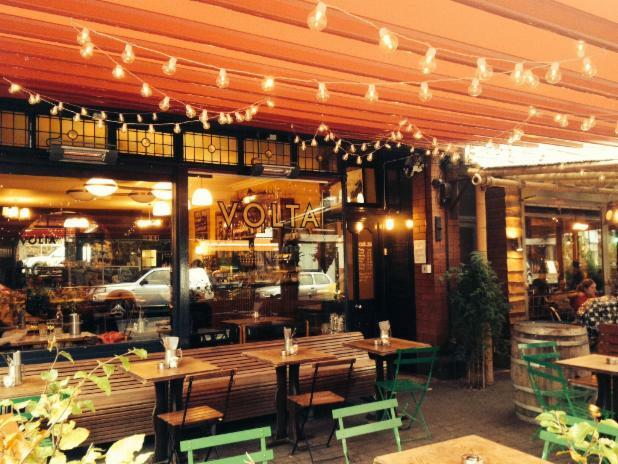 Volta in West Didsbury was recommended as a must try and isn’t somewhere I’d clocked as a roast dinner venue without that heads up (thanks Lottie!). It’s a too cool for school bar and eaterie on Burton Rd, specialising in small plates & steaks with an emphasis on well sourced produce. The interior is very hipster, styled with retro furniture and drop glass pendant lighting, very of the moment. I’d just left the vintage show at Victoria Baths and am a fan of reloved items, they give a sense of warmth and comfort hard to replicate with new. 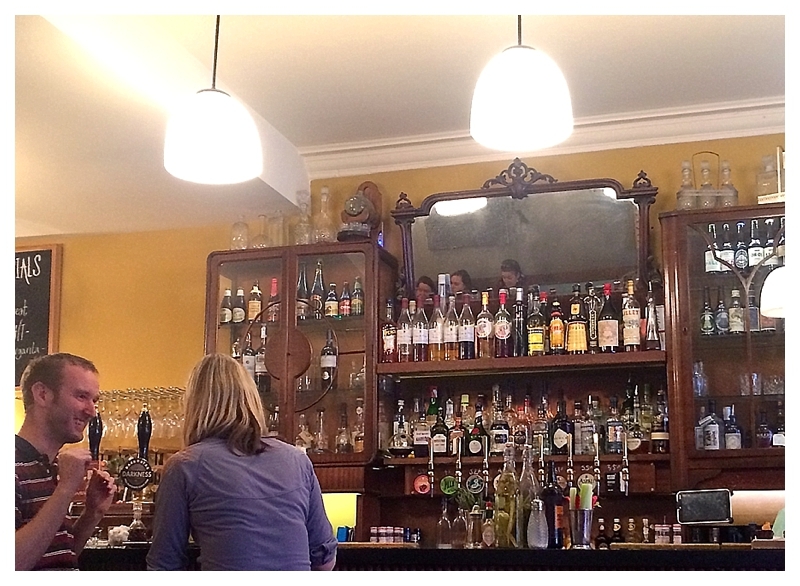 It’s not the most relaxing of bars with it’s hard, narrow seating but nonetheless was packed. The old dears who wandered in, took a gander and shuffled back out were quickly replaced by Generation Y’s who weren’t bothered about comfortable pads to sit on. More fools the former as we were to find out. 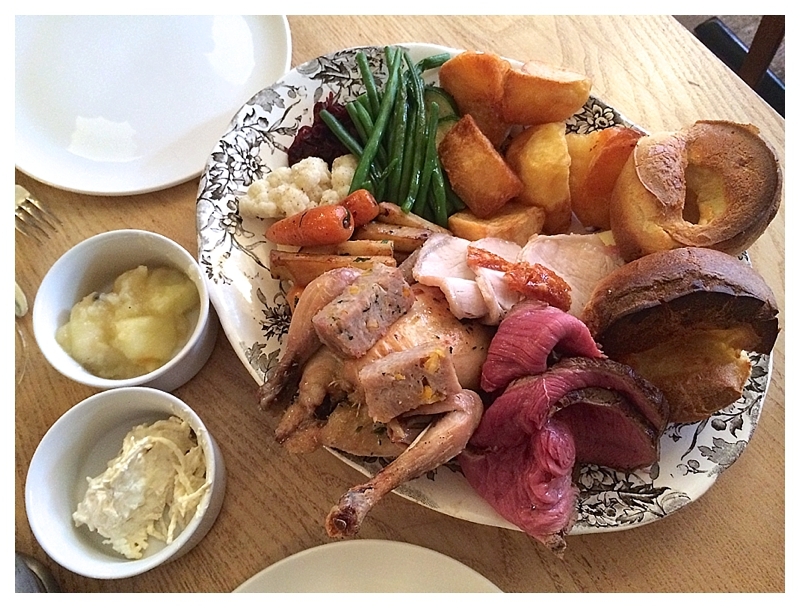 Given the choice of three ‘Rare Breed Roasts’, beef, pork or chicken at £13 a plate or a sharing dinner for two at £26, we plumped for the platter, even with his tendency for food theft. And it was excellent, properly excellent. Thick slices of tender rare beef, succulent pork and a whole poussin meant two happy grub tuckers not fighting over meat in an unseemly manner. Lashings of piping hot, tasty gravy in a separate boat, freshly made apple sauce and horseradish, plus well cooked, al dente veg complimented the meat perfectly. Nice touch having roast parsnips, not many places brave enough to try those. Top roast potatoes too, thickly golden and crunchy, not going soggy in the gravy, plus mash, beans, courgettes, cauli AND carrots. All in all veritable veg patch. The downsides were negligible, more heat to the horseradish required, warmer Yorkshire puds and the rectangular stuffing bricks were a bit bland. But honestly, that’s just me being picky, it was on the whole superb. I was gutted that he ate the crackling by mistake so I can’t report back. He doesn’t even like crackling, the weirdo! Don’t be expecting silver service or space to stretch out and relax, but for food alone it’s well worth the visit on a hungry winter’s afternoon. We wouldn’t hesitate to recommend or return, fab little place which deserves local support. And not so local too, obv, if you’re a stranger to these parts who fancies travelling in. I’ll definitely be recommending it to my guests at The Pad (where you could stay should you be one of the aforementioned Strangers To Town). Plus who can resist a bar with such fabulous festoons?! Do Up Diary #33 Dormers, buy two get one free? Yum. It’s 7:10 am and looking at the beef at this hour in the morning is making me crave a roast dinner NOW!